using simpler models, and it can improve the classification accuracy and performance. based on the latent properties of datasets for improving the accuracy of data mining tasks. used by the algorithm to as shown below table 2, to predict the bugs in the module. based classification where classifier is trained on the historic data with associated classes. a little clue in selecting a relevant classifier algorithm. Classifier, draws hyper-planes such that all the points that satisfy a hyper plane belong to a class. choose the classifier based on the dataset at hand. proposed method is worth implementing only if the there is a drastic improvement of accuracy. 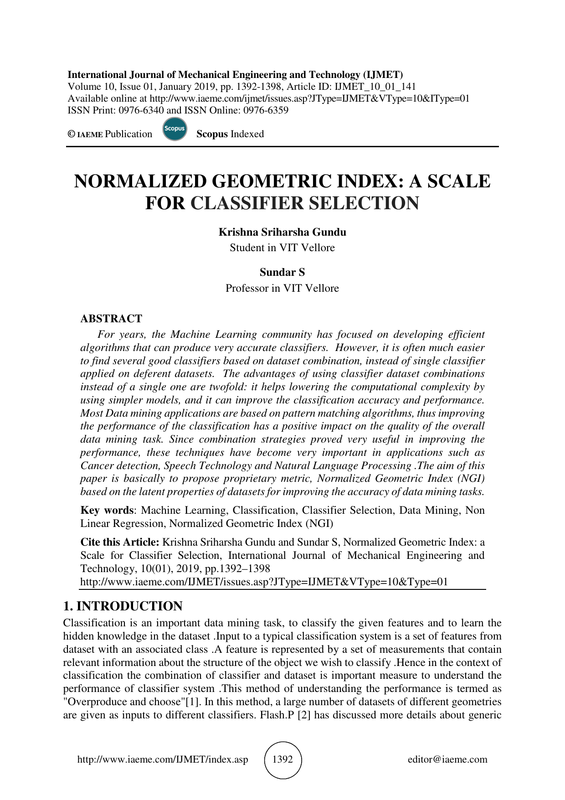 selection of classifier ensemble uses another classifier ensemble.
. This manipulation of dataset could loose some crucial information about the dataset. classifier based on the dataset parameters for optimal classification accuracy and execution time. classifiers and choose the right fusion function thereby saving time and computation complexity. of observations, as long as enough care is taken to avoid overfitting. features) would imply better classification. observations will not be sufficient for the classifier to perform the classification. data into different classes. By combining the above points, we the following metric. • Random Forest takes the decision from an ensemble of 100 trees. • SVM uses sigmoid kernel for classification. as a function of NGI metric for each classifier. of NGI will be selected for determining the region of performance. A table of Classifier Accuracy for the NGI values. corresponds to the datasets having less number of classes, more observations and less features. chosen as x. Using non linear regression, a function is created. These functions are as follows. These equations approximately describe the behaviour of classifiers for different NGI values. NGI value. All the approximations are having an R-squared value greater than 0.85. Workshop on Multiple Classifier Systems, pages 30–44. Springer, 2000. Peter Flach. The art and science of algorithms that make sense of data,2012. T van Gemert. On the influence of dataset characteristics on classifier performance. B.S. Information Processing Systems, pages 2962–2970, 2015.
the Sixth ACM Symposium on Cloud Computing, pages 368–380. ACM, 2015. Italy, June 21-23, 2000 Proceedings, volume 1857. Springer Science & Business Media, 2000.
systems as hybrid systems. Information Fusion, 16:3–17, 2014. Syntactic Pattern Recognition (SSPR), pages 45–56. Springer, 2000.